Locals pub with an eclectic mix of people. We opted to have a meal here and there was plenty of it. The ale selection was a bit limited - Harveys Sussex Best Bitter & Sharps Doom Bar. The barmaid was cheerful. Clean toilets too. Recently visited Three Cups on a recommendation, and we were not disappointed. The chefs, both from Poland, prepared a lovely meal including an asparagus starter with Serrano ham and balsamic glaze and Stilton, entrees for our group: roasted duck, steak mushroom pie, sea bass, roasted pork and fish cakes. All were prepared with care and culinary imagination. The highlight of the meal were the desserts, lemon meringue pie, chocolate cheesecake and a banana-toffee pie. The presentation included stained glass sauces of mango, berry and chocolate with a dusting of sugar, and a crown of clotted cream and a yellow cape gooseberry. As a US-based food writer, I would recommend this pub to anyone in the area. Though it can be difficult to find, Three Cups Inn is worth the drive. This pub was showing some disquieting problems when two of us broke our journey for lunch in mid-August. The real ales were Harvey's and two guests, and we went for the latter. The Weldon's had not been pulled through (at 1:30 pm), so the first pint was rejected. OK after pulling through. The Skinner's was flat and absolutely undrinkable, not vinegary but septic and tasting like a Belgian lambic. The bar service was friendly and accommodating (it had to be), but the Skinner's was left on sale. My partner was very pleased with his steak and chips. My sausage and mash had good-quality sausages made leathery by being too long in the hotplate, with an excellent balsamic onion gravy. The washbasin in the mens' toilets was absolutely filthy, with hairs and an empty soap dispenser. This is quite unacceptable in a pub serving meals. Hence I'm giving this pub a low mark, and hope that other visitors find it improved. We went here in early May. We found it to be a very nice and clean pub with a decent sized menu. I had steak and mushroom pie which was delicious and Mrs Pubsmithy had Ham, Egg and Chips which was very good too. We will certainly be going back. 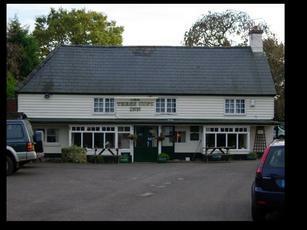 Friendly roadside inn, with a pint of Harveys Old enjoyed in front of a blazing log fire on a cold, crisp winter day. What more could one want?